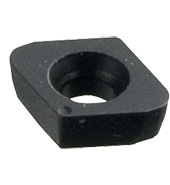 •Submicron carbide inserts are fully ground, Patented design. •Special design milling cutter and ground insert for semi-finishing 3D surface milling for mould industry. •Series C is developed for replacement of the other milling cutters with ram feed. •Patented Dual Relief Angle Insert ! Drag left or right for more information. Patented insert, fully ground corner radius. 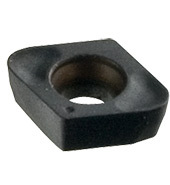 • Submicron carbide insert, AlTiN coated, K10 grade. • Flat cutting edge design, universal type for all kind of materials. •Submicron carbide insert, AlTiN coated, K20F grade. • High positive angle, special chip breaker design, higher wearing resistance. • Good for carbon steel and low alloy steel. Copyright 2019 Jimmore International Corp. All Rights Reserved. Best viewed with Internet Explorer 10, FireFox, Chrome with 1280 x 768 resolution .